List of heaviest spacecraft is a listing of selected spacecraft by mass. Spacecraft may change mass over time such as by use of propellant. The heaviest artificial objects to reach space include space stations, various upper stages, and discarded Space Shuttle external tanks. Between 1994 and 1998 the Shuttle-Mir complex of docked spacecraft was the heaviest artificial object in orbit (when docked), growing heavier from its start as Mir continued to be expanded. It weighed at least 250 tonnes (250 long tons; 280 short tons) in a 1995 configuration. Currently the heaviest spacecraft is the International Space Station, nearly double Shuttle-Mir's mass in orbit. It began assembly with a first launch in 1998, however it only attained its full weight in the 2010s, due to its modular nature and gradual additions. Its mass can change significantly depending on what modules are added or removed. All numbers listed below for satellites use their mass at launch, if not otherwise stated. ^ a b "Mir Space Station". nasa.gov. Retrieved 2017-09-16. ^ David S. F. Portree (March 1995). "Mir Hardware Heritage" (PDF). NASA. Archived from the original (PDF) on August 3, 2009. Retrieved March 30, 2007. ^ Broad, Willaim J. (1995-06-29). "Shuttle Set for Rendezvous Today With Russia's Mir". New York Times. Retrieved 2017-09-16. ^ "Compton Gamma-Ray Observatory". NASA Space Science Data Coordinated Archive. Retrieved 2017-09-16. ^ "Onyx 1, 2, 3, 4, 5 (Lacrosse 1, 2, 3, 4, 5)". space.skyrocket.de. Retrieved 2018-12-30. ^ "Fact Sheet". ESA/Hubble access-date=2017-09-16. ^ "Envisat Space Segment". ESA Earth Online. Retrieved 2017-09-16. ^ "Envisat Orbit". Heavens Above. Retrieved 2017-09-16. ^ Gini, Andrea (25 April 2012). "Don Kessler on Envisat and the Kessler Syndrome". Space Safety Magazine. Retrieved 2012-05-09. ^ "EchoStar 21". Retrieved 2017-07-06. 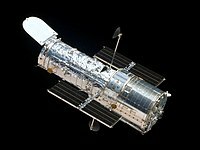 ^ "Chandra X-ray Observatory Quick Facts". Marshall Space Flight Center. Retrieved 2017-09-16. ^ "Cassini". NASA Space Science Data Coordinated Archive. Retrieved 2017-09-16. ^ Elizabeth Gibney (11 March 2016). "Mars launch to test collaboration between Europe and Russia". Nature News. Retrieved 14 March 2016. ^ "RadioAstron User Handbook" (PDF). RadioAstron Science and Technical Operations Group. 29 July 2015. Retrieved 2017-09-16. ^ "Juno Mission to Jupiter" (PDF). NASA FACTS. NASA. April 2009. p. 1. Retrieved 2017-09-16. ^ "Galileo Jupiter Arrival" (PDF) (Press Kit). NASA / Jet Propulsion Laboratory. December 1995. Retrieved 2017-09-16. ^ Graham, William (2013-11-17). "Atlas V launches MAVEN en route to Martian adventure". NasaSpaceFlight.com. ^ "Lunar Reconnaissance Orbiter (LRO)". NASA Space Science Data Coordinated Archive. Retrieved 2017-09-16. ^ "MESSENGER". NASA Space Science Data Coordinated Archive. Retrieved 2017-09-16. ^ "Voyager 1". Goddard Space Flight Center. Retrieved 2017-09-16. ^ "New Horizons Pluto Kuiper Belt Flyby". NASA Space Science Data Coordinated Archive. Retrieved 2017-09-16.